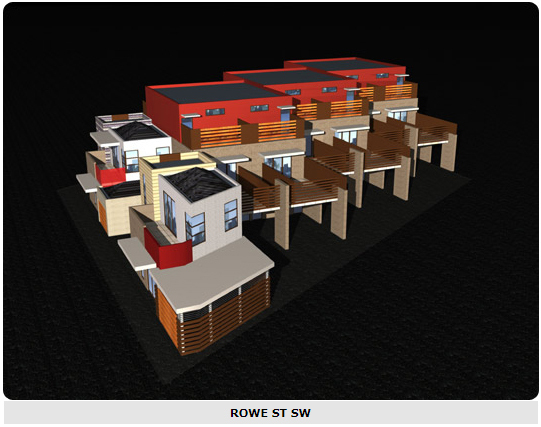 Rowe Street Alphington – This project involved the development of a former industrial site that had been rezoned to Residential 1 by the Darebin City Council. The site had been cleared and had a northern aspect in close proximity to the railway station. The site was located on the corner of Rowe and Miller streets and was separated from the adjoining residential development to the south by a ROW. 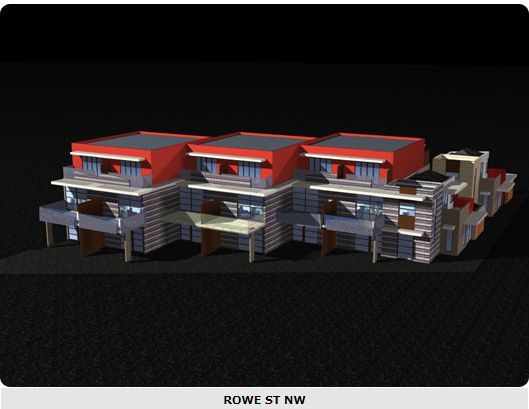 This opportunity enabled each dwelling to face Rowe Street, without a crossover, with separate parking being provided from the ROW. The eastern edge of the site still abutted a large warehouse building. Miller Street is occupied by a variety of timber bungalows (circa 1930’s) in a tree lined street, while the adjoining industrial development in Rowe Street was characterized by warehouse buildings. Hence the reference points for height and scale were from the adjoining industrial buildings. The side street frontage being Rowe Street required an active residential frontage and this opportunity enabled the designer to orientate a dwelling to this street. The separation of the site also ensured overlooking and overshadowing impacts onto the southern boundary would be minimized.